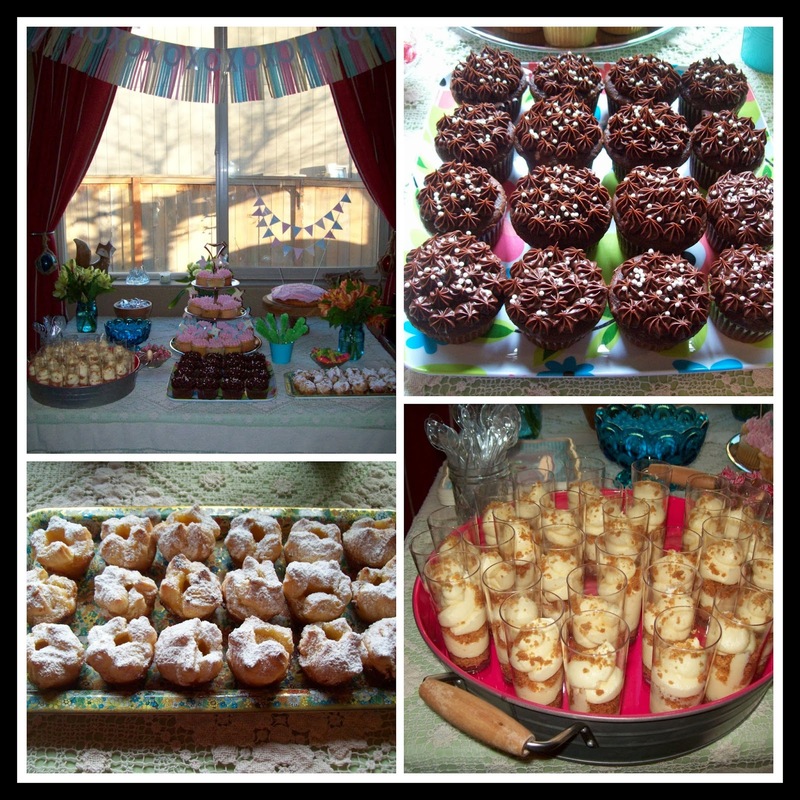 My youngest sister is getting married this month and this weekend I had the fun of hosting her bridal shower. 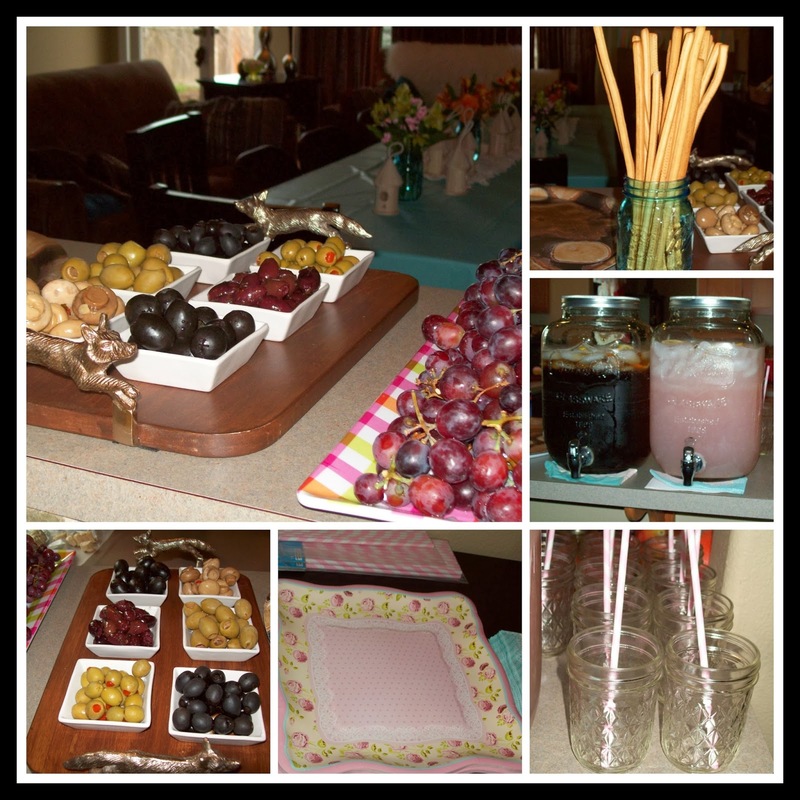 I really enjoyed planning this bridal shower and so I thought I would share our fun day. First things first, every party starts with an invitation. 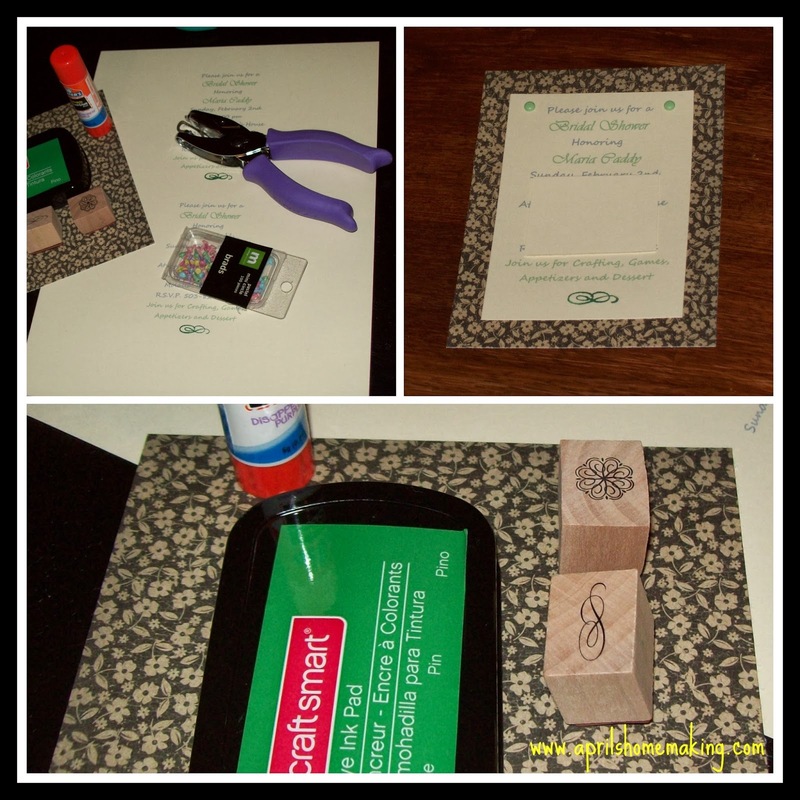 I love paper crafting so I decided to make the invitations. I chose a simple design, and printed out the invitation in pretty fonts using my computer's basic word program, and printed them onto cream cardstock. I then cut them to size and glued them onto some pretty vintage floral paper, added some coordinating brads to the top and a stamped flourish on the bottom of the page. I decided on a vintage floral theme for the shower after falling in love with some of the decorations I purchased from oriental trading company vintage wedding line. The decorations and plates matched nicely with the other decor I had planned. I made little floral bouquets to decorate around the living and dining rooms and put them in the turquoise Heritage Ball Jars that I just love, you can find them in many stores or online at Amazon through my link Ball Jar Heritage Collection Pint Jars with Lids and Bands, Set of 6 . I just saw they have green as well, I may need to add those to my collection. 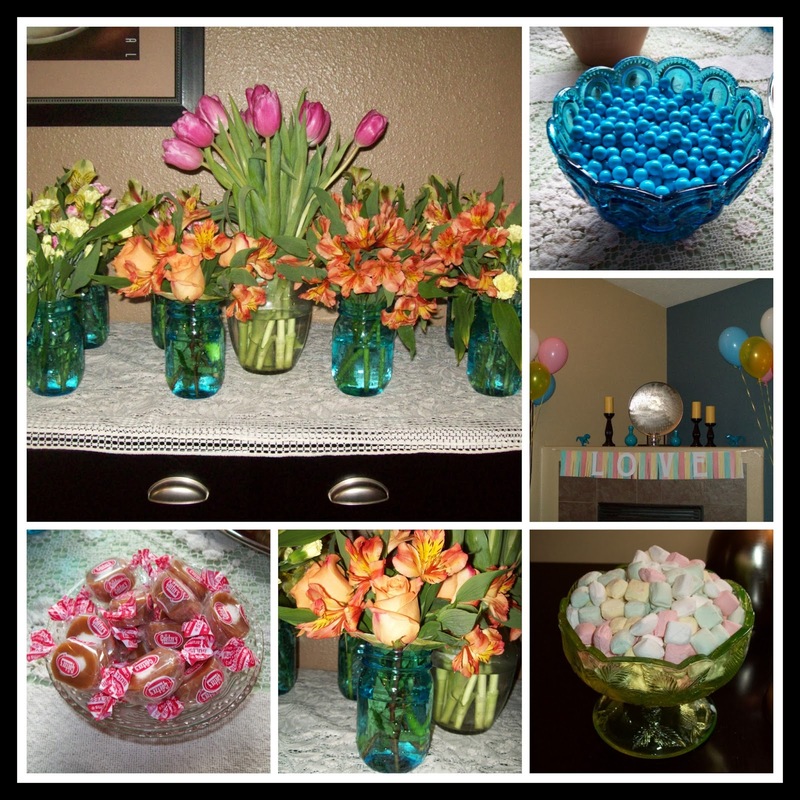 :) I also put out lots of candy in some of my coordinating vintage candy dishes, I loved all the color from the flowers, candy, and vintage colored glass! 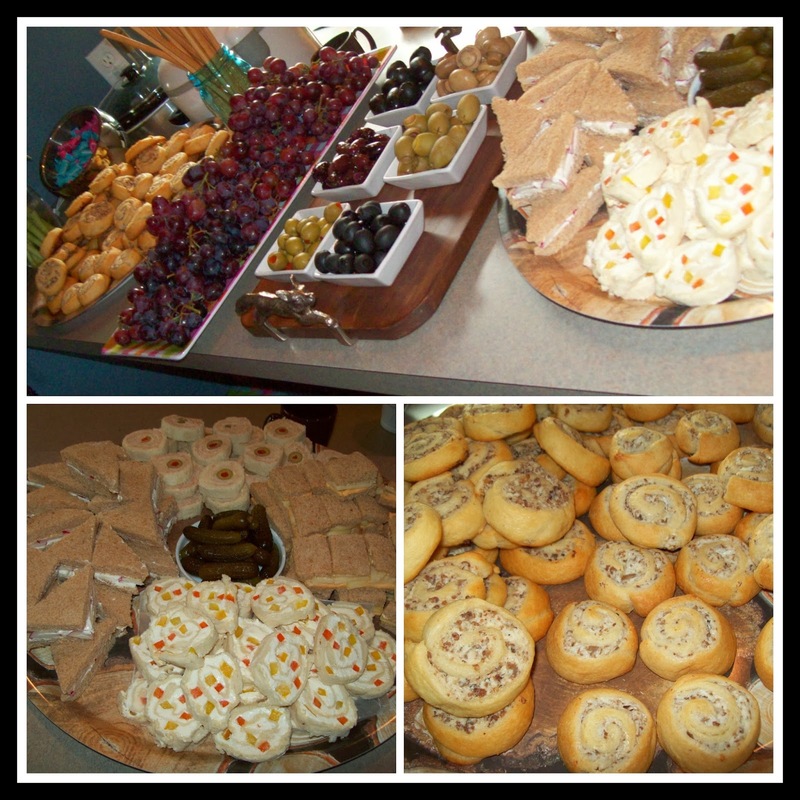 When everyone arrived, we started with a nice little luncheon, I made plenty of tea sandwiches. You can read about how to make them in my tea sandwich tutorial, I will also be sharing some of my new recipes from the shower in a post later this week. I made some mushroom pinwheels and sausage pinwheels, and set out a nice assortment of olives as well as some Parmesan bread sticks. I served ice tea and pink lemonade in large Mason Jar style drink dispenser (you can find a similar one through my link at Amazon Georgia Peach Mason Jar Beverage Dispenser ). The cups were little jelly jars with pink and white striped paper straws, the jelly jars were just the right size for little glasses, and I am in love with paper straws and all the patterns you can buy them in these days! After lunch it was time for games and activities. I knew I wanted games that were not too embarrassing, all the gals in my family are on the introverted side, so I chose two classic shower games that I thought we would all enjoy. 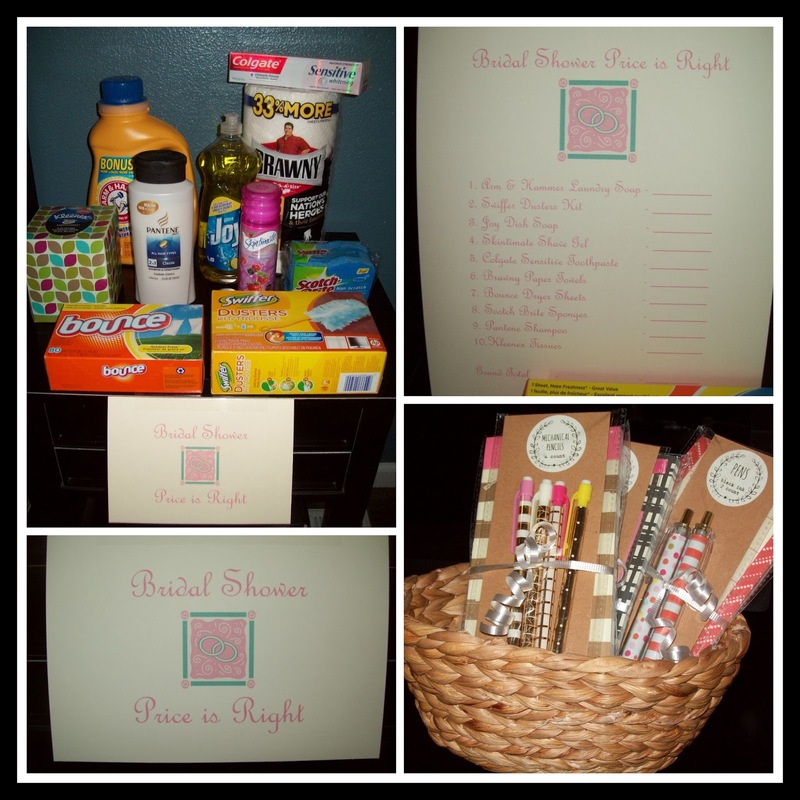 The first game was Bridal Shower Price is Right. I purchased 10 household items at my local grocery store, all on one receipt so I would have the exact total. Then, using the basic word program on my computer, printed out the game on cream cardstock in pastel ink colors in French Script font, and adding some bridal clip art. Everyone writes down their guess for how much each item costs and the person with the closest to correct total wins. We also played remember the items on the tray game, where you place a bunch of items, I had about 30 little items, on a tray and let everyone study it for a minute or two, then they have two minutes to write down as many things as they can remember, the person who remembered the most items is the winner. For prizes I found cute tablets with matching pen and pencil sets from Target's dollar bins. For the next activity I decided that a craft would be fun, so I found some cute wooden birdhouses at Michael's, and bought a bunch of paint along with paint brushes and paint trays for everyone, so we could paint birdhouses. Before the birdhouses were painted I had them sitting along the center of the table as part of the table decorations. 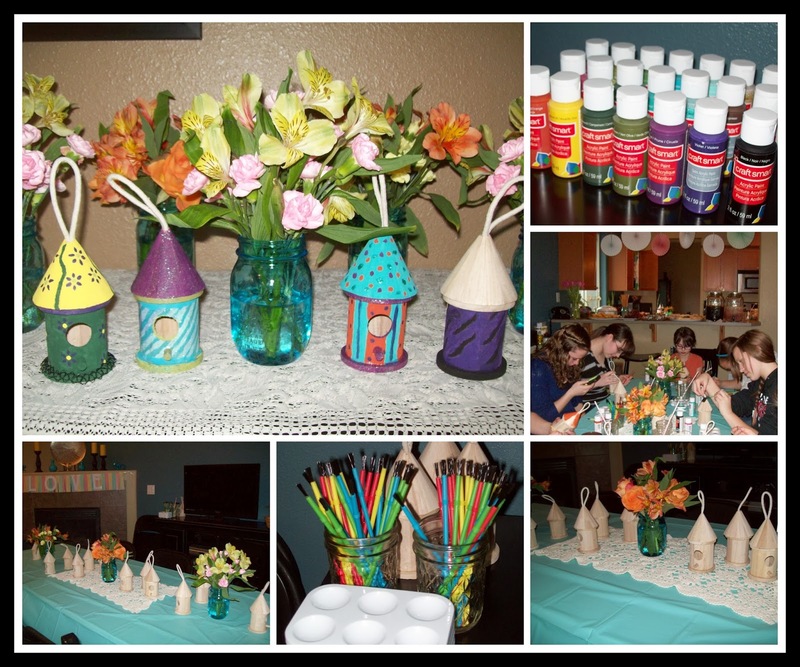 This was a fun activity, it was nice to sit and chat while everyone was crafting, and all the birdhouses turned out nice with all sorts of different designs and colors. After we were all done crafting, my sister opened her presents, and then we all enjoyed treats from the dessert buffet. I made white cupcakes with pink lemonade frosting, and chocolate cupcakes with chocolate frosting. 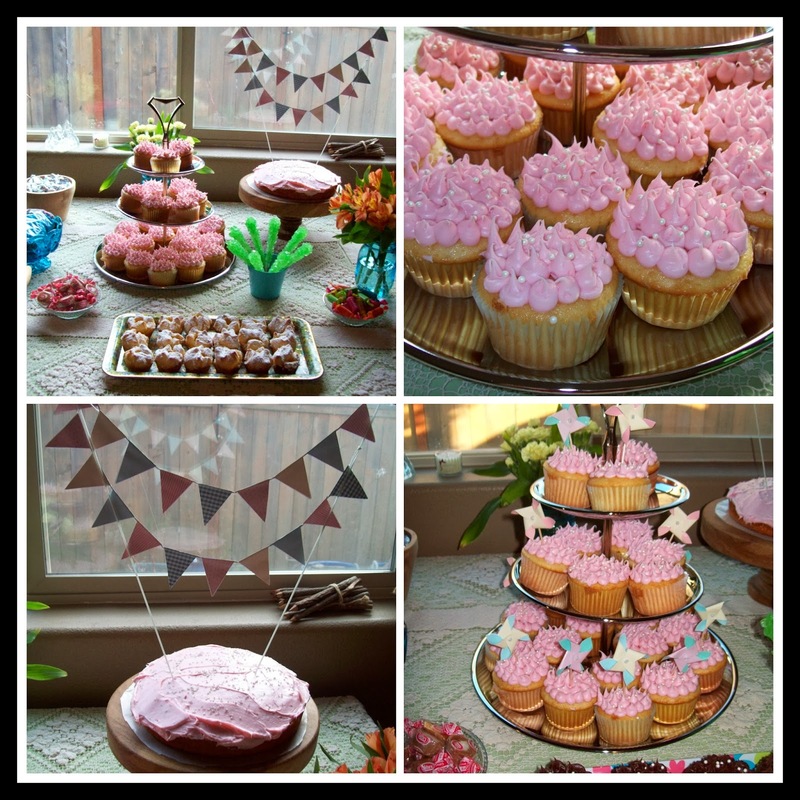 I piped on dots for the the pink lemonade cupcakes and used a star tip for the chocolate cupcakes, and topped them both with little candy pearls. I made a single layer white cake with pink lemonade frosting and topped it with a very cute mini cake banner. 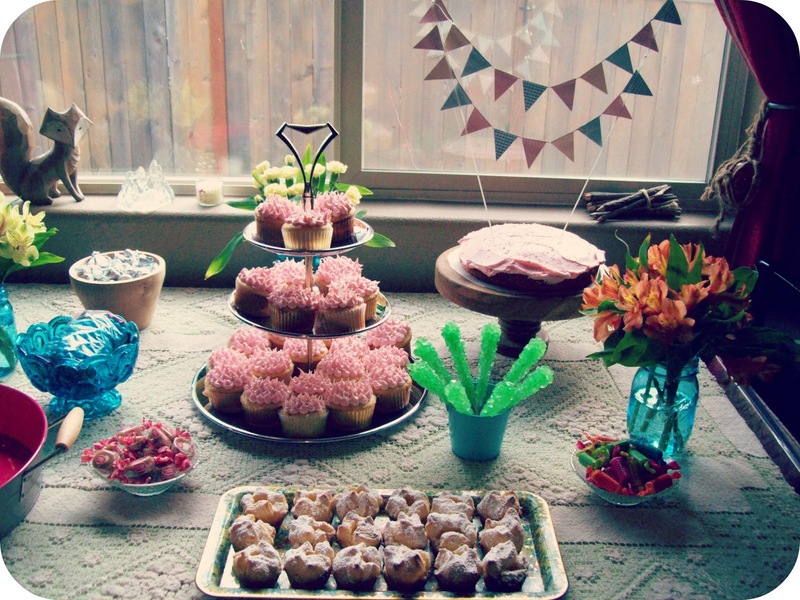 I set out plenty of little candy treats, and decorated the table with flowers, and a lace tablecloth, and put a cute paper fringe banner on the window above the table. I also made some easy lemon puffs which I will include the instructions for in my recipe post to follow, and some cute little cheese cake shooters which everyone loved. 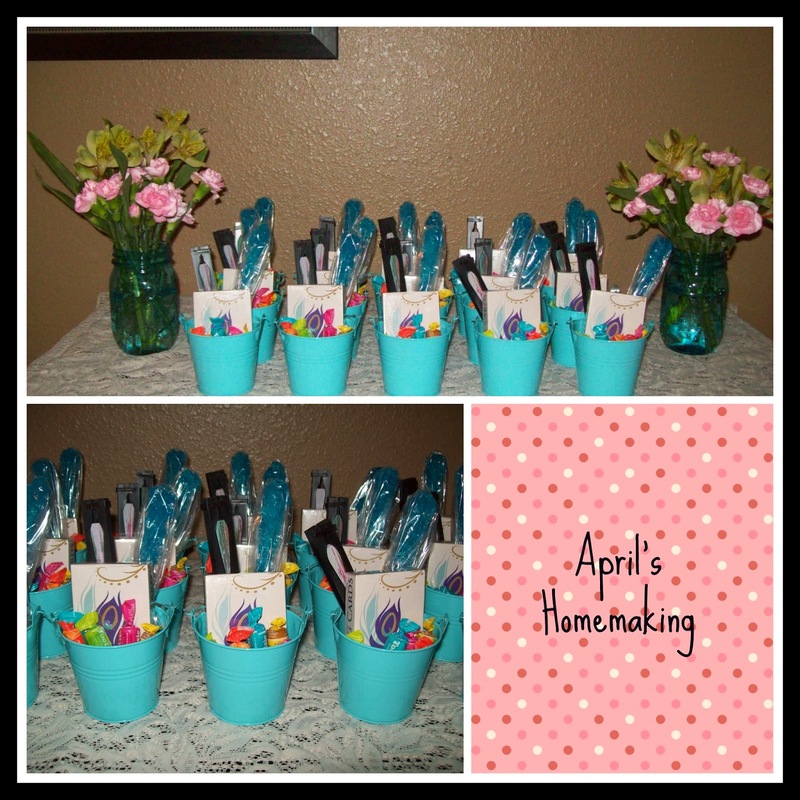 I had so much fun putting everything together for this party, I loved visiting with my sisters and family and friends, altogether it was a very nice day! What a lovely day!! It is so much fun to shower a loved one with love before her big day! !